As writers, we try to draw readers fully into each scene. Not only do we want them to picture what’s happening, we want them to feel as if they are sharing the POV (point of view) character’s experience. 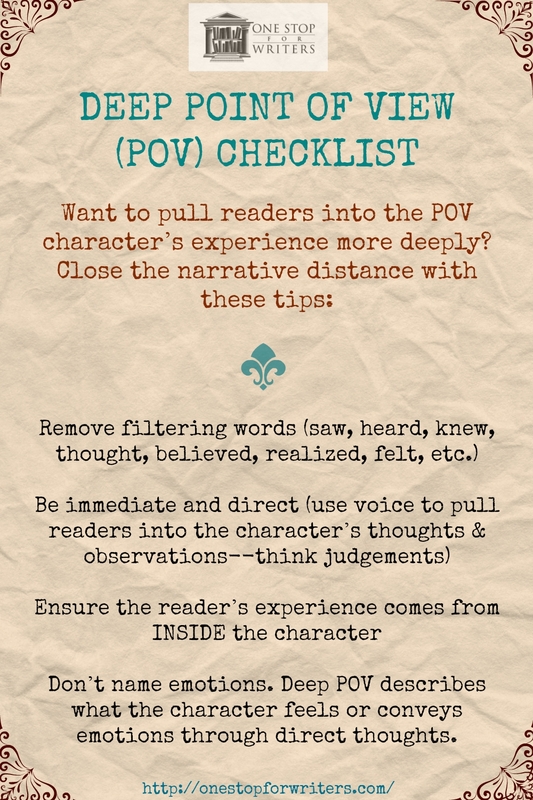 Shared experiences are all about emotion, and Deep POV is one of the best ways to encourage feelings to pass between readers and characters. To achieve this level of closeness, details from the character’s world are filtered through the point of view character’s emotions and senses. Readers not only see, hear, smell, taste, and touch what the character does…they feel as well. Imagine a character on a moonlit walk across a football field, enjoying the clean scent of grass, the glimmer of dew, and the chance to be alone. The reader sees this setting through a filter of peace: all is good in the world. But change the description (a cold breeze kicking up, the unsettling flap of a raised school flag in the darkness, shadows clustering at the field’s edge) and the mood shifts. All is not good in the world. Unease crawls into the reader’s lap because they experience the setting as the character does. There’s a stretched feeling, a tension that hugs each word. The character (and the reader) is alert, waiting for something bad to happen, for something to go wrong. As you can see, shared emotional moments help readers immerse themselves into the story. But, we can always do more. If we truly want to show readers who our character is and help them experience what they feel, we should choose settings that have an emotional value. Settings with an emotional value are meaningful or symbolic. They represent something to the protagonist and possibly other characters. A location containing an emotional value might remind a character of a past event and the feelings associated with it, good or bad. It may represent safety, loss, failure, connection, love, or one’s greatest success. It could also reveal a fear, a desire, or hope. The list goes on and on. For example, imagine a character being asked to an important business lunch meeting. A writer could choose any restaurant for this scene, but why go with something generic? Instead, let’s choose one with a specific emotional value: the same restaurant where, two years earlier, our character’s girlfriend turned down his marriage proposal. By making this setting meaningful to the protagonist, everything changes, because even though time has passed, an echo of that old hurt and rejection will affect him while in this restaurant. He may find his gaze turning to the table where he popped the question. The heaviness of the cutlery, the smooth linen napkins, the taste of wine…everything will evoke memories of that day. And, in turn, his turbulent emotions will influence his behavior. Does he blow the meeting, or can he ride the pain out? Suddenly we have tension, conflict, and possible plot complications. And as a bonus, we’ve created a scenario where the reader can’t help but feel empathy for the character. So how do we go about creating an emotional value within our setting? The first step is to brainstorm the best setting match for a particular scene. Look at what will happen in the scene and which emotions are at play. Identify your hero’s scene goal—what must he do, learn, or achieve? And what do you want him and the other characters involved to feel? Once you know the answers to these questions, imagine different settings where this scene might take place, ones that fit the story and are logical locations for your character to visit. Think about how each one can represent something significant to the protagonist and ties into the outcome of the scene. If you like, make a list. Often the settings that pop immediately to mind are the most obvious, but with a bit of digging, some more creative and interesting choices can be unearthed too. Setting description is so much more important than many writers think. If you’d like to know more about Emotional Values and how to make sure your setting is working hard for your story, take a peek at The Urban Setting Thesaurus: A Writer’s Guide to City Spaces. This entry was posted in Conflict, Description, Empathy, Experiments, Fear, Mood and Atmosphere, Motivation, Pacing, Setting, Setting Thesaurus Guides, Show Don't Tell, Subtext, Tension, Uncategorized, Writing Craft, Writing Lessons. Bookmark the permalink. Setting is something I need to work on. Thanks for the tips – they give me some good questions to prompt ideas as I work through revisions. Great post. Just put it on my class wiki. Settings are my “sweet spot” as far as description and feel 😀 Great stuff, Angela! So important! We have to infuse meaning and emotion where we can. I often think of my setting as another character.